I’m a sucker for anything that includes a jolt of vinegar. I just can’t seem to get enough of the tang. 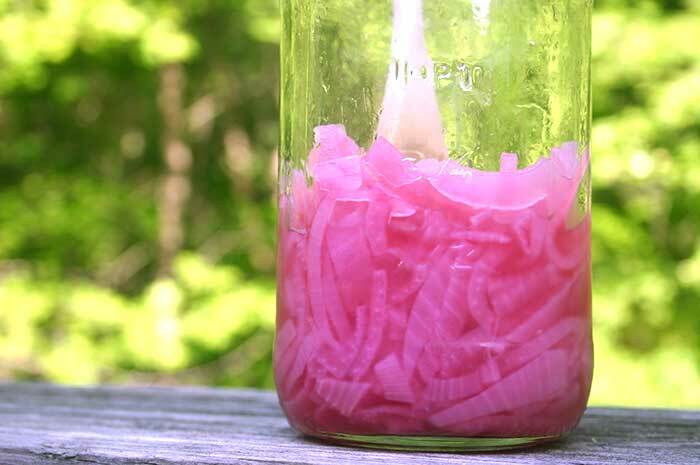 This brilliant pickled pink onion relish is the perfect condiment in my book. I’ve used it on salads, to top burgers and served alongside meatloaf. I’ve even eaten these onions straight from the jar as a snack. This recipe comes from the book 125 Best Vegan Recipes (affiliate link) by Maxine Effenson Chuck and Beth Gurney. Even though I do eat some meat, I try to get most of my nutrition from plant-based sources. Vegan cookbooks are a great inspiration. 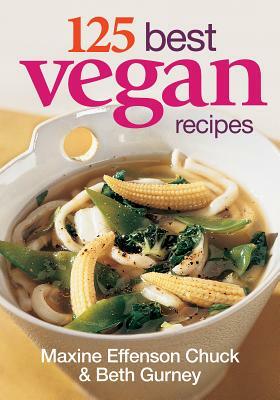 In addition to recipes, this cookbook features information about how to stock a vegan pantry and describes vegan ingredients that may not be familiar. Soy bacon, anyone? Hidden in the back just before the index, the book also includes lists of relevant books, vegan-friendly food suppliers and websites that provide information about the vegan lifestyle. I like the overall layout of the book and was delighted to see that the font size is large enough that I don’t have to hunt around for my reading glasses before I start cooking. The number of servings is there in a black box at the upper left of each recipe, but for some reason it’s easy to miss. Nutritional information is not included. All in all, I’ve been happy with the recipes I’ve tried from this book. Watch out for those Barbecued Tofu Nuggets. I don’t make them exactly according to the recipe, but they are addictive! Disclosure: I received a free copy of 125 Best Vegan Recipes by Maxine Effenson Chuck and Beth Gurney from Robert Rose for review purposes. All opinions are my own. Bring water and salt to a boil in a large pot over high heat. Add onions, wait until the water returns to a boil, then boil for about 1 minute. Drain and transfer onions to glass jar. Add vinegar and stir to mix well. Let cool to room temperature, stirring occasionally. Cover and refrigerate for at least 2 hours to allow flavors to develop. This relish will keep, covered and stored in the refrigerator, for several weeks. If you are watching your Sodium intake, experiment with vinegars that contain less salt (such as apple cider vinegar). Picked pink onion relish… I’ve tried that before and it’s seriously good.